Containers can be stylish garden fixtures in their own right, irrespective of what they hold. Aesthetically, adding plants in pots adds another layer of interest and depth to the landscape with the varying heights they offer. Pots and containers offer many advantages over planting in the ground. They allow you to have a great amount of control over soil type, nutrients, and drainage. They can be portable, provide easy access, and rein in aggressive plants. Citrus trees can be grown in pots and brought inside when the weather cools. The cold winters and hot, dry summers of the Inland Northwest really limit our available plant palette. Making your plants portable, however, can open up new possibilities. Growing non-hardy plants like citrus in pots allows you to bring them inside for the winter to protect them from freezing temperatures. Tender succulents, tropical plants, and other favorites from southern climates can be planted in containers and enjoyed outdoors during our warm months. After a summer outdoors, they can be transitioned to houseplants for the winter. Similarly, plants that are stressed by our long, hot, sunny summer days can be moved to more sheltered, shady locations at the peak of summer. For ultimate portability, choose lightweight plastic pots and a well-drained potting mix. If you love the look of ceramic and terra cotta pots, consider planting in a plastic insert for the best of both worlds. Canna lilies in a carved ceramic pot add a tropical flair to this lakeside landscape. For annual plants that are only going to last one growing season, it can feel like a lot of work to get down and plant them in the ground for a few months’ beauty. Planting annuals in pots, however, can lessen that burden. Depending on the size of the pot, it can be lifted onto a counter or provide substantial height itself, making it easier on the body. Potting soil is also usually easier to work than native soils, which can be compacted or full of clay or rocks. It’s simple to customize soil conditions for specific plants, adjusting the nutrients, acidity, and organic matter in each container according to the plants’ needs. When the growing season is over, empty pots can be put away until spring rather than leaving bare swaths of dirt, or decorative containers can be left in place to serve as winter interest. Small trees like curly willow can be grown in containers to control their roots. Most gardeners have had to deal with aggressive plants with spreading root systems and know the work involved in containing or eliminating them. Planting these troublesome species in containers can be a great solution to include them in your garden with less risk. Many plants in the mint family are well-known for their rhizomatic growth, so pots and planters are an excellent way to enjoy their aromatic foliage and flower spikes without running afoul of their root systems (they can, of course, still spread by seed). And if you simply must have extremely invasive species like bamboo or horsetail in your garden, containers are the only way to responsibly grow them. It’s not just perennials that make good container plants, however. Small trees can be maintained in planters, both for visual interest and to prevent unwanted habits. 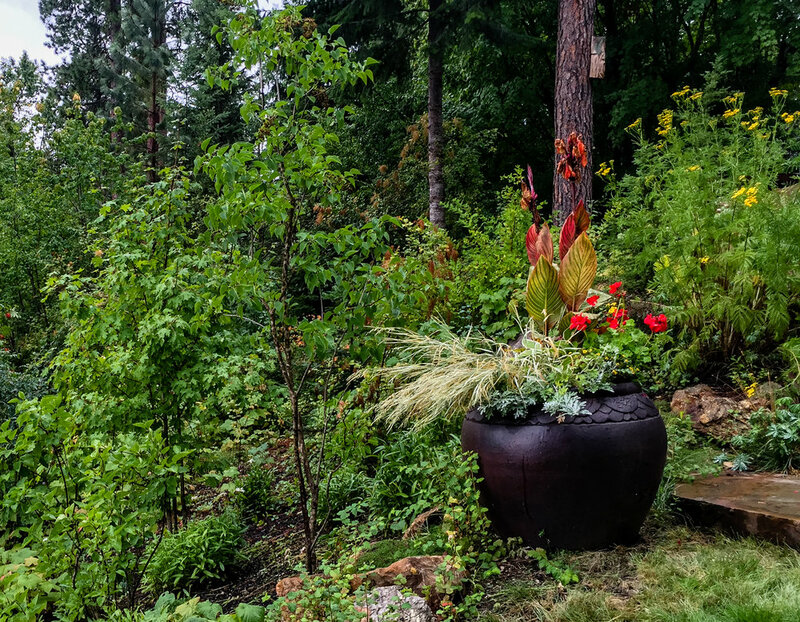 Trees that sucker or invade sewer and irrigation lines, like willows, sumacs, or aspens, can be enjoyed in a planter instead. If you’re up to it, root pruning every couple years can help to ensure the vitality and longevity of your potted tree. Corkscrew or curly willow is a cultivar of the Chinese willow species Salix matsudana. Left to its own devices, corkscrew willow will grow into a small tree from 20’ to 30’ high, but it can be heavily pruned and maintained as a smaller shrub without harming the plant. As its name suggests, corkscrew willow has twisted, curly branches and similarly curly leaves. The stems are an attractive feature in the garden or when cut and used in floral arrangements. It’s a quick-growing plant that tolerates a wide range of conditions, so it can be a good solution for trouble spots. While its curly branches are a fantastic winter feature, corkscrew willow’s interesting foliage makes a statement as well, especially in autumn when the leaves turn yellow. While corkscrew willow is a fast-growing tree, it is also a short-lived one, with a lifespan of just a couple decades. In many landscapes, it is a better choice to maintain it as a large, multi-stemmed shrub. Like most willows, corkscrew willow responds well to coppicing, where the plant is cut down to the ground to stimulate the growth of vigorous new shoots. This makes it easy to control the size of the plant and provides an opportunity to harvest the stems for decorative use. Because corkscrew willow tolerates pruning so well, it is an excellent choice to grow in large pots or containers where it might be necessary to control the size. In the ground, corkscrew willow’s shallow root systems have been known to lift nearby paving, so care should be taken in locating it. While it will thrive in moist soil with full sun, corkscrew willow will tolerate a wide range of exposure and soil conditions, with the caveat that it does not do well in drought.